In this week’s episode, I am delighted to bring you my lively and engaging interview with the poet and novelist, John Keene. In this wide-ranging conversation we discuss his early artistic pursuits, encouraged by his parents, towards drawing, visual art, and writing, the writers who mentored him, and his long-standing fascination with African diasporic history. Moreover, he gives us a particularly in-depth look into his inspirations, experiences, and craftsmanship as a novelist and poet who is engaged with experimental forms. John earned his B.A. at Harvard University and an MFA from New York University. As a long-time member the Dark Room Writers Collective, he cherishes the “electric atmosphere” and the connections made with the individuals of this group to this day. John Keene’s work includes his poetry book Seismosis, with drawings by Christopher Stackhouse, and his experimental novels Annotations and Counternarratives. 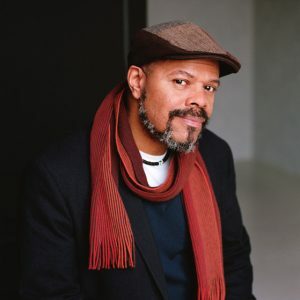 John Keene, a professor at Rutgers University in Newark, NJ, and has received fellowships from Cave Canem, the New Jersey State Council on the Arts, the New York Times Foundation, Yaddo, and the Bread Loaf Writers’ Conference. You can find is work through major booksellers and you can find him blogging on-line: at http://jstheater.blogspot.com/. Here at CBC, we love to support our featured artists. Support John Keene by ordering his books online or in-person at your local bookstore. As for social media, you can support him by following his blog.